Baked Papaya has long been popular in the southern parts of Georgia and in Florida where papaya grows like a weed in the back yard. You can find papaya everywhere now. Try this. 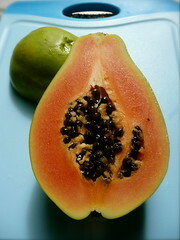 Cut mature but unripe papaya in halves lengthwise and remove seeds. Sprinkle with a little sugar and orange, lime or lemon juice; or a little cinnamon in place of the juice. Bake 20 minutes at 350 degrees and serve immediately This is for an average sized papaya. If yours is an extra large you may need to adjust cooking times..